While new cancer immunotherapies offer fresh hope, not all patients respond to the currently available treatments. The race is on to identify efficacious combination therapies and next generation therapeutics, but preclinical efficacy testing is often hampered by immunogenicity in animal models. B cell-deficient animal models permit efficacy testing of immuno-oncology (IO) therapeutics when anti-drug antibodies would otherwise limit clinically relevant dosing. EMD Serono's immuno-oncology pipeline includes M7824, a bifunctional therapeutic designed to target two different pathways used by cancer cells to evade immune control. 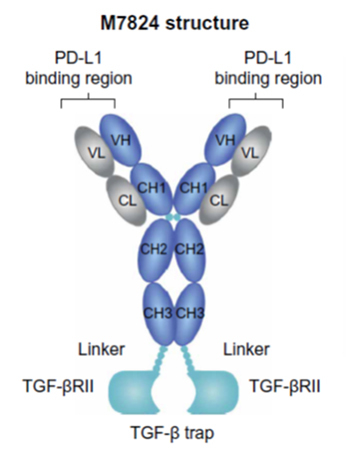 M7824 combines a monoclonal antibody against PD-L1 fused to a receptor fragment designed to trap TGF-β. Inhibition of PD-1 and PD-L1 has been exploited to develop multiple approved cancer drugs, including the blockbuster Keytruda. The cytokine TGF-β can promote tumor progression and metastasis as well as abet tumor immune evasion. M7824 combines simultaneous blockade of both the PD-L1 and TGF-β pathways. Although M7824 is a fully human immunoglobulin G1 (IgG1), it cross-reacts with murine PD-L1. Similarly, the TGF-β trap portion of M7824 recognizes both the human and murine cytokines. This allows preclinical studies in mouse models using the actual clinical candidate rather than a surrogate. Unfortunately, immunogenicity can pose challenges in efficacy testing of biologics. Administration of monoclonal antibodies and other protein drugs can induce expression of anti-drug antibodies (ADAs) in immuno-oncology animal models. These ADAs can significantly complicate efficacy determinations by reducing exposure — or even neutralizing the therapeutic. In a recent paper, EMD Serono scientists overcame the immunogenicity problem through use of a mouse model incapable of producing ADAs. "Because M7824 is a recombinant human protein," they wrote, "it induces a strong immunogenic response in immunocompetent mice if dosed repeatedly for more than 6 days. Therefore, B cell-deficient mouse strains (Jh and μMt−) were used for in vivo studies to enable testing of clinically relevant repeat dosing schedules...1"
The researchers employed syngeneic mouse tumor modeling to study M7824 in the B cell-deficient mice1. While Taconic Biosciences' Jh mice lack B cells, and thus cannot produce antibodies, they retain the other immune cell types important for immunotherapy evaluation. While limited to single doses of M7824 in wild type mice, the researchers could use clinically relevant dosing schedules in the Jh mice. In an orthotopic breast cancer model using the BALB/c-derived EMT-6 cell line engrafted in B cell-deficient Jh mice, M7824 induced tumor regression, with superior results over treatment with either single component therapy, anti-PD-L1 or TGF-β trap1. M7824 also provided long-term protective immunity against tumors; when Jh mice which had been cured of EMT-6 orthotopic tumors were re-challenged with subcutaneous EMT-6 cells 218 days later, they did not develop tumors — even though no further M7824 treatment was provided1. Because Jh mice retain immune cells other than B cells, the researchers were able to interrogate changes to various immune cell types in the tumor models. Lan et al. found that M7824 treatment increased the density of CD8+ tumor infiltrating lymphocytes (TILs) and tumor-infiltrating NK cells (TINKs) relative to treatment with anti-PD-L1 or TGF-β monotherapies. They also saw effects on myeloid cell populations, including dendritic cells, neutrophils, monocytes and macrophages1. Through cell depletion experiments, the EMD Serono researchers were able to identify CD8+ T cells and NK cells as playing major roles in the anti-tumor activity of M7824 and hypothesized that myeloid cells may also be involved1. Supported by these observations, EMD Serono has entered M7824 into phase I studies against solid tumors1. 1. Lan, Y.; Zhang, D.; Xu, C.; Hance, K. W.; Marelli, B.; Qi, J.; Yu, H.; Qin, G.; Sircar, A.; Hernández, V. M.; et al. Enhanced preclinical antitumor activity of M7824, a bifunctional fusion protein simultaneously targeting PD-L1 and TGF-β. Science Translational Medicine 2018, 10 (424).